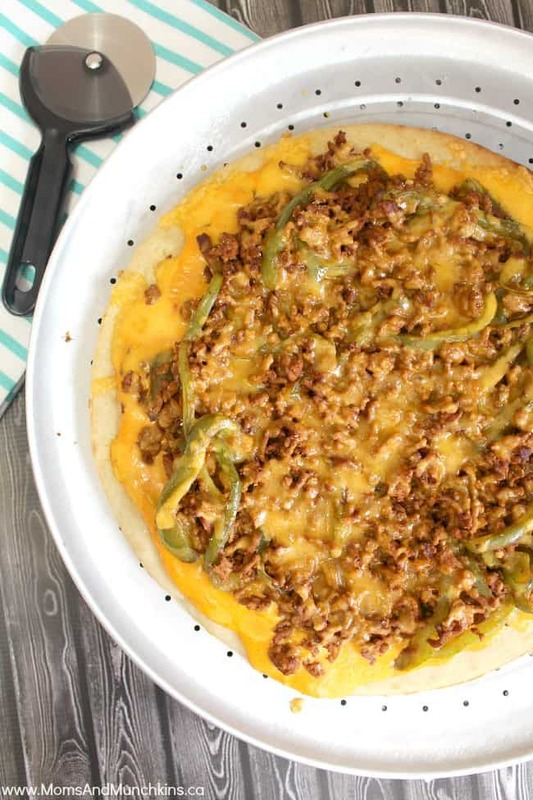 This turkey taco pizza is so easy to make and it tastes delicious! You can mix up the ingredients a bit to make it as spicy or as mild as you like. I take the easy route when making pizza and I buy a pizza crust already made and baked. It saves me a lot of time when trying to make supper for the family. You can customize any of the ingredients below to fit your tastes - add as much cheese as you want, as much veggies, and as much spice as your family can handle. Brown turkey in frying pan. Add taco seasoning (according to instructions on package), onion and green pepper. Simmer until most of seasoning & water is absorbed and the vegetables start to get tender. Pour queso cheese over pizza crust (add as much or as little as you'd like). Top with turkey mixture then top with shredded cheese. Cook pizza according to directions on pizza crust packaging (example, cook at 425 for 10 minutes). Use pizza cutter to slice. Serve with sour cream on the side as dipping sauce. The cheese sauce on this turkey taco pizza is a delicious alternative to tomato pizza sauce. The cheese usually comes in mild, medium or hot flavors so be sure to read the label when purchasing. We use the medium cheese sauce, hot taco seasoning and shredded cheese with a little spice in it. Planning to make the turkey taco pizza for a pizza party on family fun night? Here are a few ideas for your pizza party. For more delicious recipes, check out our special Recipes page. Never miss a delicious update by following us on Facebook, Twitter, Pinterest and Bloglovin’. my husband and daughter would love this meal! Yummmmm! Pinning! Must make this soon. You always come up with the best things!! I am so giving this a try….next time we go to the groceries! 😀 YUMM! This looks really delicious 🙂 – I’ve definitely never tried anything like this.